God's building a habitation for God and man is more symbolic in the Old Testament. Its in type in the Old Testament. It is in reality in the New Testament. The typology of God giving the Law in order to secure a dwelling place on the earth is undeniable in the Hebrew Bible. The details of the tabernacle were given with exquisite percision. And in Deutoronomy God prophesies much about the place on earth where His (new?) name would be. The tabernacle was the movable dwelling place. What we have to grasp here is the symbolism. And in that city, God BUILDS a house as His dwelling place where God and His people meet together. You are reading the bible correctly. But you must relate what you ae saying to what this temple is all about, and how it serves the purpose of establishing that place where man and god meet. You need relate this to Aaron meeting directly wit god, inside the tabernacle in a cube shaped Most Holy Room, one that measures 20X20X20. You must focus on the "exquisite precision" and details given for this Most Holy Place, and all the hints in regard to the same repetitious geometry in the Bible, in the Jewish Rituals, and in the Jewish Tabernacle in oder to understand this "place." In the OT tabernacle and the Temple of Solomon that place is a cube shaped room. 16 The city lies in a square, its length being the same as its width. And he measured the city with his reed�12,000 stadia (about 1,500 miles); its length and width and height are the same. The thinking for 1000 years across all the whole of the Roman Wolrd was about God and Jesuswho together replaced and eliminated all the myths, paganism, and that ancient pantheon of gods and goddesses from the Christian world. 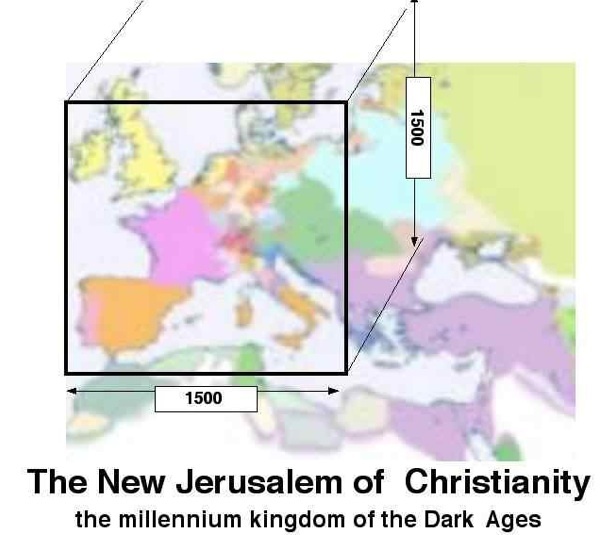 The Kingdom of God was within the whole Roman World for 1000 years. I like your post on the law of God and our subjective experience of it. It is perfect and it is the �testimony� of God. James calls it the �perfect law of liberty� (James 1:25) and Romans 7:12 has a categorical statement about the �goodness� of the law. NAS Romans 7:12 So then, the Law is holy, and the commandment is holy and righteous and good. Regarding how the law is the perfect message of how God behaves, the tablets of the law are called the testimony, the ark is the ark of the testimony and the tabernacle is the tabernacle of testimony. The aspect of the law never passes away. Rcv Exodus 16:33 And Moses said to Aaron, Take a pot, and put an omerful of manna in it, and place it before Jehovah, to be kept throughout your generations. 34 As Jehovah commanded Moses, so Aaron placed it before the testimony to be kept. 25:16 And you shall put into the Ark the Testimony which I shall give you. 25:21 And you shall put the expiation cover on top of the Ark, and into the Ark you shall put the Testimony that I shall give you. 22 And there I will meet with you, and I will speak with you from above the expiation cover, from between the two cherubim which are upon the Ark of the Testimony, of everything which I will give you in commandment to the children of Israel. 31:18 And when He had finished speaking with him upon Mount Sinai, He gave to Moses the two tablets of the testimony, tablets of stone, written with the finger of God. 38:21 This is the sum of the things for the tabernacle, the Tabernacle of the Testimony, as they were counted according to the commandment of Moses for the service of the Levites by the hand of Ithamar the son of Aaron the priest. Your first sentence reminds me of Romans 2:13-15. It mentions how the Gentiles show the work of the law written in their hearts. For example, it seems that everyone has an idea of fairness. That is one of the key features of the law. Sometimes greed gets the better of this idea or clouds it over, but it is still there. But these verses in Romans embody the paradox of the law. �The doers of the law shall be justified,� but, as you say, we cannot do it by our own power. Actually there is precedent for this. For example, in the gospel passage about the rich young ruler, after the young man turned way Jesus said, "With man this is impossible, but with God all things are possible." (Matthew 19:26). Jesus made a demand on the rule that was impossible with man, but possible with God. I think it is like that with the law. Lex I just became a forum member yet this New Testament quote more than suggests an answer for you.It's Matthew 5 verse 17 which the King James prints"Think not that I am come to destroy the Law or the prophets.I am not come to destroy but to fulfil ".The New Jerusalem Bible first printed some half a century ago prints"Do not imagine that I have come to destroy the law or the prophets.I have come not to abolish but to complete them".Perhaps the Kjv words attributed to Christ can help you answer your question if Christ's ministry ended "the Law".Yours was the very first post.Take care and God bless the blessed!Absolutely no twisted parallels! Absolutely straight forward!Gary V. Giardina!This sent before 8:21 P.M. December 14th. 2013. Did you mean to reply to me or Lex. You got me! �Do not think that I have come to abolish the Law or the Prophets; I have not come to abolish them but to fulfill them. 18 For truly I tell you, until heaven and earth disappear, not the smallest letter, not the least stroke of a pen, will by any means disappear from the Law until everything is accomplished. 19 Therefore anyone who sets aside one of the least of these commands and teaches others accordingly will be called least in the kingdom of heaven, but whoever practices and teaches these commands will be called great in the kingdom of heaven." "Those who believe that the geological record is in any degree perfect, will undoubtedly at once reject my theory."